1. Did you always want to be a writer? If not, what did you want to be? No, I didn’t always want to be a writer. I’ve always loved reading, but writing came about unexpectedly for me after a psychologist friend of mine suggested I write a short story to help me deal with the stressful circumstances surrounding my son’s birth (he had to have open heart surgery shortly after he was born). I entered the short story in a competition. It won, and I was infected with the writing bug. But what I REALLY wanted to be was a hacker! Well, maybe not a hacker, but I love the concept of writing code and like playing around with HTML. And no one would suspect a quiet librarian of being a hacker, now, would they? 2. Do you work another job as well as your writing work? Yes, I’m a teacher librarian in an all girls high school. And other than writing, it’s the best job in the world! Not only do I get to buy huge amounts of shiny new books on a regular basis, I also get to talk about books and technology with the coolest, wackiest and most innovative age group on the planet – teenagers. 3. What is the name of your latest book, and if you had to summarize it in less than 20 words what would you say? 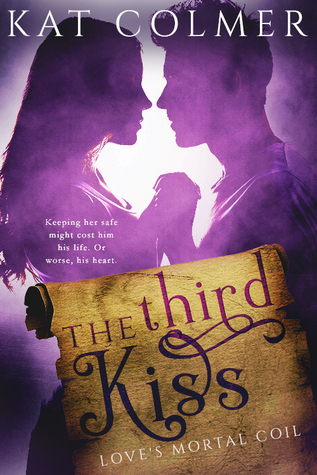 My latest book is titled The Third Kiss. It follows the curse-related fallout from an impulsive kiss between relationship phobic Jonas and his levelheaded best friend Cora. 4. Do you have plans for a new book? Is this book part of a series? The Third Kiss is the first in the Love’s Mortal Coil series. I’m currently writing book two. 5. Do you have anybody read your books and give you reviews before you officially release them ie. your partner, children, friends, reviewers you know? I’m very fortunate in that I have two excellent critique partners who are also great friends. My drafts go to them before they go anywhere else, even my editor. Always. I don’t know where I’d be without them! 6. Do you basic plot/plan for your book, before you actually begin writing it out? Or do you let the writing flow and see where it takes the story? The old plotter or pantser conundrum. When I first started writing, I was convinced I’d be a thorough plotter from start to finish (I’m the type of person who likes to be in the correct lane waaaaaay before I need to turn off the road), but I was shocked – and a little horrified – that detailed plotting didn’t work all that well for me. I’m in no way a true ‘fly by the seat of your pants’ writer, but you could say I’m a plantser – a cross between a plotter and a pantser. I need to know where I’m starting and how I’ll finish, as well as all the major key turning points along the way, but I have no idea what will happen between those main goal posts holding up the story. I think the moral, if any, of The Third Kiss is “Don’t mess with the Devil. I won’t end well.” Another message I was trying to bring across is to encourage people to look beyond the superficial. The “test of true love” curse in The Third Kiss came about because of society’s tendency to focus too much on outward beauty instead of what’s within. We need to learn to see with the eyes of the heart instead of tho ones in our head. 8. Are there any New Authors you are interested in for us to watch out for? and Why should we watch out for them? Definitely! If you’re a paranormal or romance YA lover, check out recently published Tamar Sloan’s Prime Prophecy series. Prophecy Awakened, the first in the series, is out already, and the second is due to hit digital shelves in September this year. Reviewers have flagged it as a “must read” for lovers of Twilight or anyone who enjoys a really well written paranormal romance. Early Nights or Late Nights? Late nights. Definitely. I can’t function creatively in the mornings until at least eight or nine am, and that’s after I’ve had a decent size coffee!